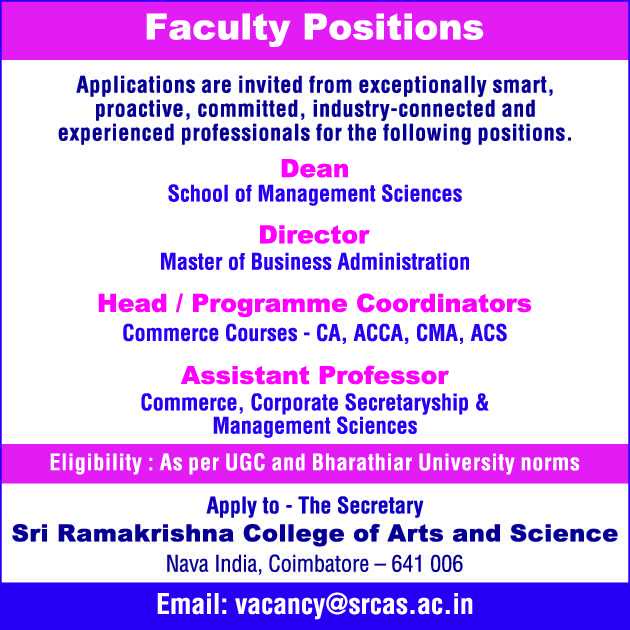 Sri Ramakrishna College of Arts and Science, Coimbatore has advertised in THE HINDU newspaper for the recruitment of Teaching Faculty- Assistant Professors / Dean / Director / Head / Programme Coordinators jobs vacancies. Interested and eligible job aspirants are requested to apply immediately from 03rd April 2019. Check out further more details below. About College: Akshaya College of Engineering and Technology (ACET) was established by Akshaya Charitable Trust in the year 2009. The trust has been founded by professionals having 25+ years experience in industry. The trust aims at imparting high quality education with strong ethics to its students..